Depletion of mitochondrial energy function is one of the most serious causes leading to the loss of cellular vitality. Healthy mitochondrial activity is vital for cells to perform life-sustaining metabolic processes. When mitochondrial function weakens in our cells, so does the vitality of organs such as the heart and brain, or in some cases, the entire body. Fatty acids (which serve as the mitochondria's fuel) must be transported through the cell membrane and into the mitochondria, in order for the mitochondria to create the energy needed to sustain cellular function. 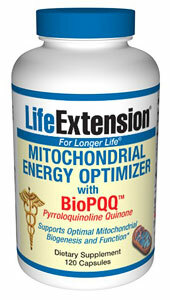 Mitochondrial Energy Optimizer has been scientifically designed to maintain mitochondrial integrity. Mitochondria are the energy-producing structures within cells. Recently scientists have discovered that mitochondrial decay is a major force behind the aging process. Mitochondrial Energy Optimizer combines the following unique ingredients to counteract structural & functional changes that occur as we age. It possesses strong and specific antioxidant properties. Protects against radiation damage and reverse post-radiation syndrome. Works as a chelator of heavy metals (i.e., a substance that binds heavy metals, possibly reducing their toxicity to the body). Stimulates the growth of neurites in the brain. A neurite refers to any projection from the cell body of a neuron. Helps maintain mitochondrial bioenergetics. Bioenergetics is the subject of a field of biochemistry that concerns energy flow through living systems. Carrys fatty acids across the membrane into the cell where they are burned as energy and utilized efficiently by the mitochondria. Enables the heart muscle to contract more efficiently through enhancement of calcium response in heart muscle cells. Is the most potent nutrient to counteract destructive glycation processes. Glycation is the cross-linking of proteins and sugars to form non-functioning structures in the body. The process of glycation can be superficially seen as unsightly wrinkled skin. Glycation is also an underlying cause of age-related neurologic, vascular, and eye problems. Helps suppress dangerous inflammatory cytokines. Cytokines are small proteins released by cells that have a specific effect on the interactions between cell, on communications between cells or on the behavior of cells. Is a potent antioxidant that helps protect healthy cells from the damaging effects of free radicals. DIRECTIONS: Take four capsules daily in divided doses early in the day, or all at once upon wakening, or as recommended by a healthcare practitioner.This product can be taken with or without food.